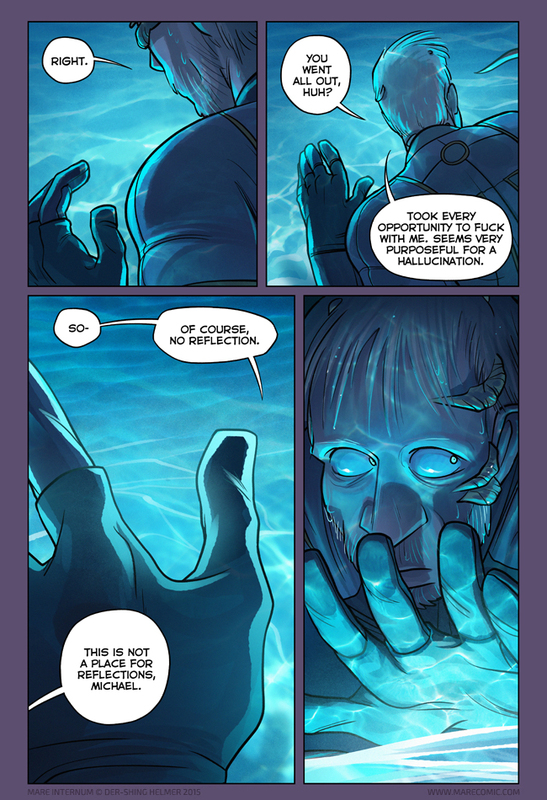 *edit* Hi guys, your comments about the physics of backlighting vs reflection is exactly what I was worried about, when I mentioned it on the previous page’s comments section!! I admit that physics is not my strongest subject, and this morning I realized I could physically test this scenario with a bagged flashlight in the sink in a dark bathroom and confirmed that you’re all right and I am wrong. So I am REWRITING THAT PART because I am wrong and I don’t like my comics to be inaccurate, please don’t freak out about this page suddenly changing… you’re right, despite the author’s weakenesses, it would not make sense for Mike to not know that stuff. This is why Mike gets annoyed with people like me. That…did not go how I expected it to go xD And LeVi from the previous page comes in, I suppose? Am I the only one who thinks she didn’t fall in with Mike? Because I think she didn’t fall in with Mike. I thought that was the point of her not crawling out onto unstable rocks to pull him up. Chapter 1, page 38, panel 5: Bex falls in. Yeah, but the silhouette that’s been stalking him is seriously un-Bex-like. Not only does Martion sub-surface fungi have the ability to communicate, but it already has a solid grasp of word-play. You wouldn’t get a reflection if the main source of light is bioluminescence in the water, I think? If there is no sorces of light above ground then yes, it would be as if he’s looking at a lamp and won’t see his reflection. To see his reflection he needs to be illuminated enough that there would be MORE light-reflected-from-his-face (which is a % of luminance from his face) coming from the water THAN the light coming directly from underwater. Dang: headfungus, concussion, or atmosphere seems to be taking its toll. The water itself appears to be glowing, so there’s nothing weird about not seeing a reflection. For most people that’d be unconsciously obvious from a lifetime of experience with lit windows at night, swimming pools at night, glass light bulbs, etc. That he thinks he should be seeing a reflection says way more than the fact that he isn’t seeing one. Well, if it’s a hallucination, then that’s going to be his mother or something. so like….have any of you ever swam in a pool with underwater lighting? if so you will remember that the light in the “water” makes it pretty dang impossible to see any sort of reflection. second off if the “water” is anything else besides H2O then you wouldn’t see much of a reflection either. Good job w/ the coloring. Keep up the good story. And good job w/ getting towards the top of TWC. Thanks for your comment, it made me realize I could test this scenario myself in the sink! And you’re right, so I fixed the text to correct my error. Why are you saying that if the liquid isn’t H2O then there wouldn’t be a reflection? Reflection is related to the refractive index (or more generally, frequency-dependent dielectric permittivity) of the materials present. These can assume various values, but if you can see the liquid’s surface (i.e. its refractive index is not the same as that of the “air”), then there’s reflection from its surface. What’s more, if the liquid is optically denser than H2O (compared to the “air”, but that probably has a refractive index of around 1), then a much larger fraction of light could be reflected from the surface. Wouldn’t the glowing overpower any reflection anyways? Come on Mike, you are a freaking Astronaut, KNOW YOUR PHYSICS. Do you have to add legs to everything? Wasn’t legschilla enough? No reflection because it’s overwhelmed by the glow. Strew the. Don’t tell me the shadow beast is a much more heavily fungified Bex. So I’m just curious, what were the original lines he spoke before the accuracy edit? Gotcha, thanks for the reply! On reflection… I don’t think it is matter of him being confused on physics of reflection (it is obvious when stuck in pool with lighting below why no reflection) as freaking out that he is changing and can’t find a mirror so imagination will make it seem worse. Sort of like guy who runs out of gas and says “of course no gas station nearby”. The new voice may come from another human who has been down here longer, and is more modified as result. No, because Mike would KNOW if anyone has been lost on Mars. I can’t believe such a basic plot point would be introduced in that manner, at this stage; lazy story telling. The beauty of a web comic is being able to make chances as you please, with that though I personally liked the original monologue better, it was more internalized and less outwardly confrontational. The way I read the original was he was pretty sure he was losing his mind and the water and lack of reflection, etc kind of confirmed it, like the idea that you aren’t suppose to be able to read in your dreams. Yeah, agreed! As a patch up I don’t think this is too bad, but I have a lot of other work to get to today, and didn’t want to take the time to redraw all my speech bubbles to a fit longer/ shorter sentiment. But like you said, that’s one of the nice things about a webcomic :] I’ll probably go back and touch it up later, as i have been doing here and there to other early pages, and nobody will be the wiser. I think it’s partly my fault, I have a certain standard for the research that goes into the comic, but I also have limitations. I’m glad to be corrected since I do want to put out a good product. All the wtf stuff should be story-related, not basic science related. You just have a very low bar for what you consider credible. Maybe the comment comes from the sentient AI he thought he lost before, now melded with its own Mare-based entity? That fungiforms around his head look like claws (shudder). Whose, I wonder? Lighting in the last panel = masterfully executed. Well done. This comic is great, thank you! And I wanted to add that I really respect that you changed it to be accurate. I love that about this comic. 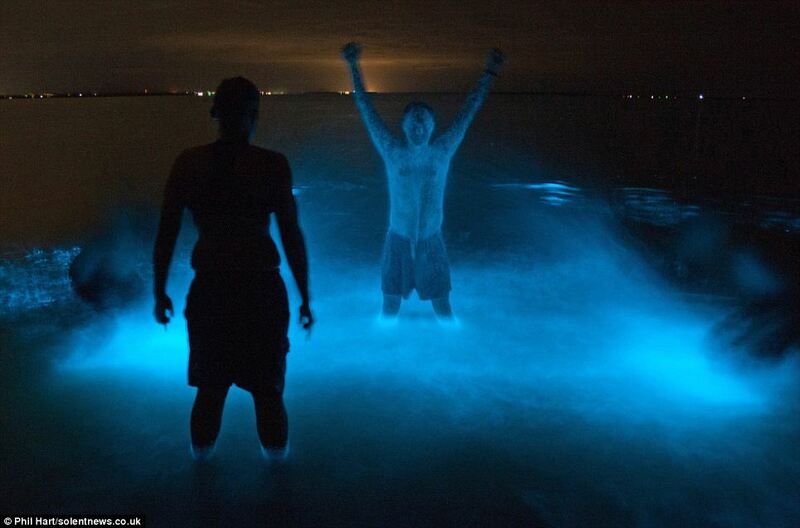 So many people would just wave their hand and say well maybe it’s glowy magic reflective water. But it’s just bad writing if you have to explain outside the comic all the time and make excuses for yourself when people point out inconsistencies. If that is Michael’s robot buddy, I will not be able to stop imagining him sounding like William Daniels. I love the expression in the last panel and the hint at something else being down there on the previous page.